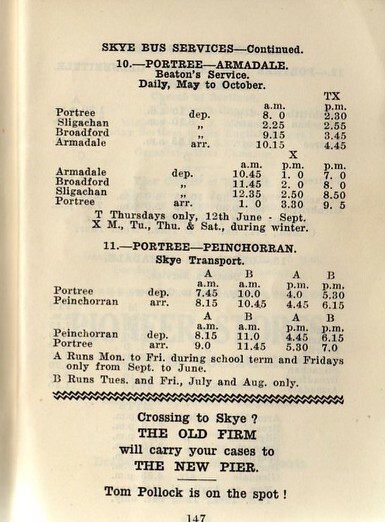 For many years from 1912 Duncan Macpherson (1882 - 1966) ran the pharmacy in Kyle of Lochalsh, from whence the ferry sailed to Kyleakin on the Isle of Skye. When not practicing as a pharmacist Duncan was a keen photographer - and an author too. He published a series of postcards of local scenes over the years and wrote several books on local heritage and history. 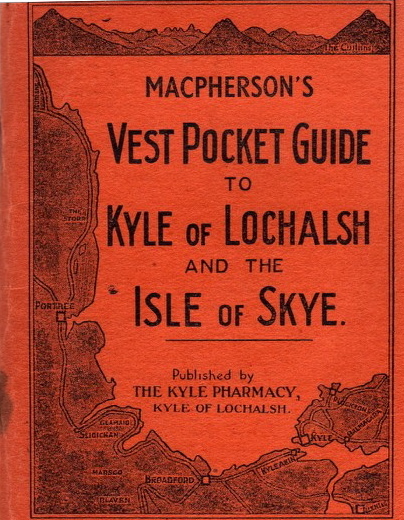 Of particular interest to the transport historian is Duncan's series of Vest Pocket Guides to Kyle of Lochalsh and the Isle of Skye. This publication ran to twenty seven annual editions over the years from 1927 to 1960, omitting the period of the second world war. Prior to the start of the guide a folded local information card had been published. An orange covered booklet of diminutive page size (5 inches by 3.5 inches - hence the name) they also included the current rail, ferry and bus timetables for the area - as well as Duncan's comments (sometimes acerbic!) as he took a very keen interest in his local community. During the 1950s the area of coverage of the guide was extended to encompass the Outer Hebrides as well. The tenth edition of 1936 ran to about a hundred pages and cost 6d whilst the twenty fourth edition of 1956 had a hundred and fifty pages and cost two shillings. 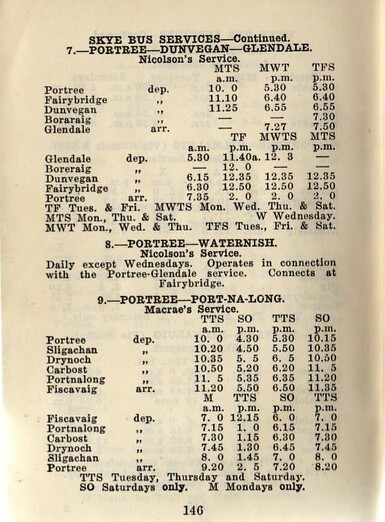 Two typical transport information pages are reproduced below, from the twenty first edition published in 1953. As the rear cover of the guide proclaimed: at the gateway to the Isle of Skye - Kyle of Lochalsh, the tourist centre of the west. 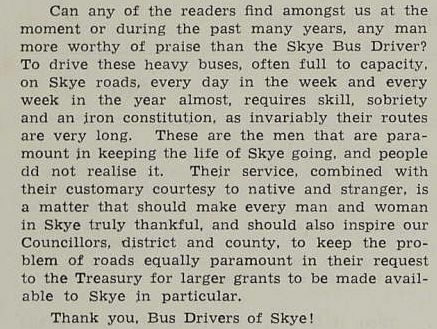 Another publication from this area was the monthly newspaper the Clarion of Skye. This was published on the third Friday of the month and edited by Alexander ("Alli Willie") Nicolson from his shop at Struan. He had great vision and wanted to encourage the people of Skye to make best of the opportunities of their birthplace. As the cover byline proudly read: Onward Skye! Queen of the West. With a circulation eventually reaching a thousand or so as well as the local island sales many copies went out by post each month to 'exiles' and other interested persons around the world. 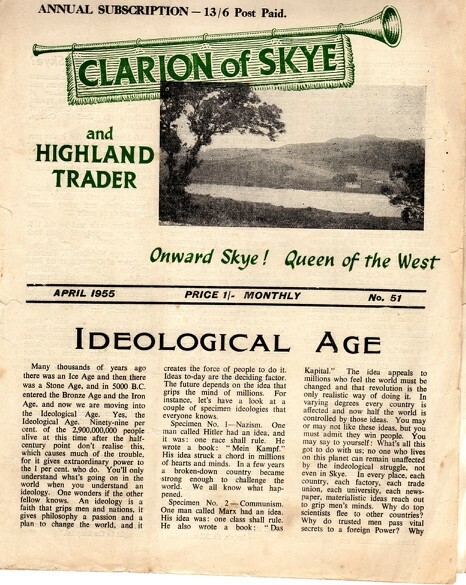 Predating the 1972 birth of the West Highland Free Press in Broadford by some twenty years, The Clarion ran from February 1951 until March 1957, when the illness of the editor brought its run to an end. I remember it fondly as a postal subscriber, albeit in my childhood years.